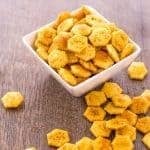 Perfect for snacking all by themselves or on a cheeseboard for some spice, Jerk Spiced Oyster crackers are the perfect bite. Or handful. I won’t judge. I’m here to bring you another snack goodie. Because that is what I do here at Take Two Tapas, smaller bites, bigger flavors! Jerk Spiced Oyster Crackers fit that bill perfectly. Small and bite-sized. Big on flavors with my sweet and spicy Homemade Jerk Seasoning. Remember when I made my Comeback Crackers two years ago? They are still in the top 10 of my most popular posts! I know why too. They are simple to make with ingredients anyone can find, and they are super tasty! People keep coming back, bite after bite. Hence the name Comeback Crackers. 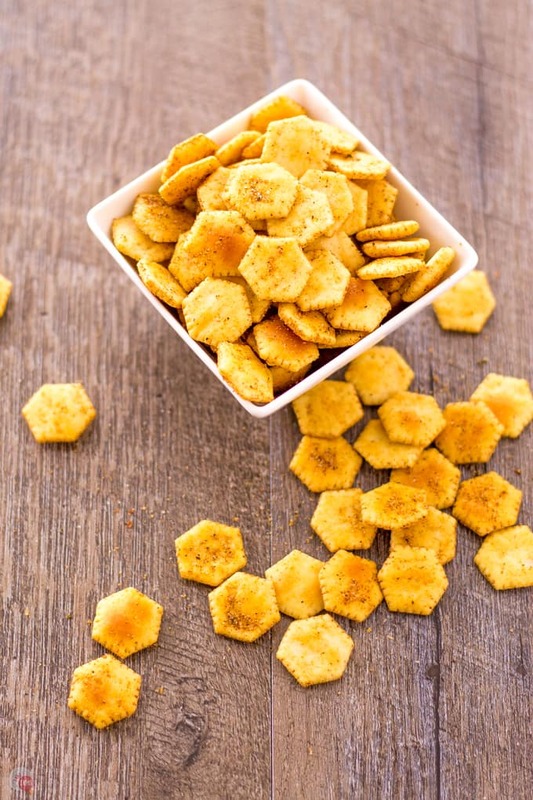 Jerk Spiced Oyster crackers are the next big one! I am always looking for things to make snack mixes out of. What about my Redneck Snack mix? All those random snack foods that people eat, all mixed together, and baked to a crisp with my homemade BBQ seasoning! Of all the items that I scoped out for putting in my Redneck Snack mix, Oyster crackers were not one of them. Maybe because I think they are a little TOO fancy for that mix. Oyster crackers are among the elite of crackers as they get their own name even though they are a basic white cracker like a Saltine. They were originally served with oyster stew but not really clear on why they are named that. 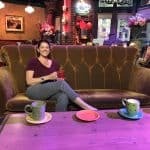 I always saw them in single-serve packages when we ate dinner out at a restaurant. That in itself means that they are fancy. But not too fancy to get some spice thrown on them! Since the oyster cracker is really a plain, slightly salted cracker, it could use a little kick in the flavor department. What better way to do that with a strong spice blend. My Homemade Jerk Seasoning is perfect for that. I made it last year to go on some chicken wings and have been using it ever since! I made a huge batch and kept in a weck jar to maintain freshness. It even survived my move to Arizona! It is hot here in Arizona and now it’s hot on my oyster crackers too. To keep from devouring the entire package, I am sending them to my hubby’s office. His co-workers are always willing taste-testers and always do the job of cleaning out all the excess snacks so I don’t eat them. 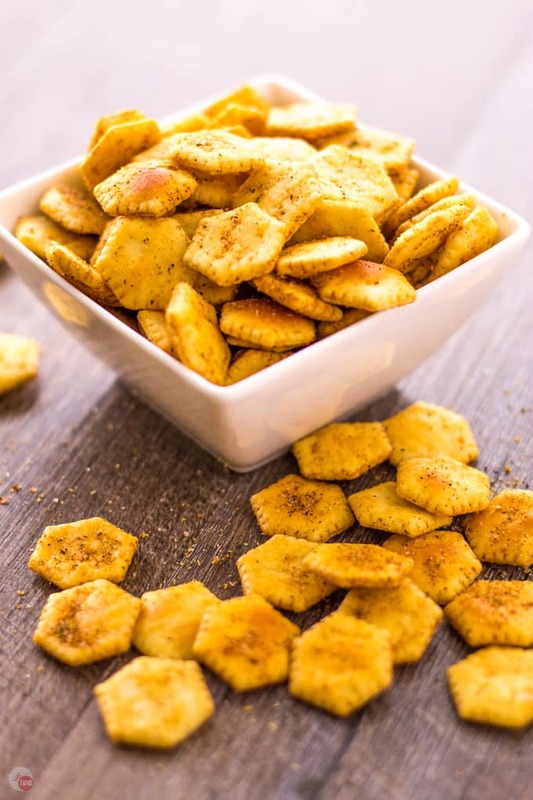 Grab some oyster crackers and some Jerk Seasoning whether homemade or store-bought and whip up some Jerk Spiced Oyster Crackers. They are great by themselves, on a cheese board, or in a soup. I will try them in a soup this winter, not right now when it is 115F. When you make these Jerk Spiced Oyster Crackers, tag me on social media #Taketwotapas @Taketwotapas! 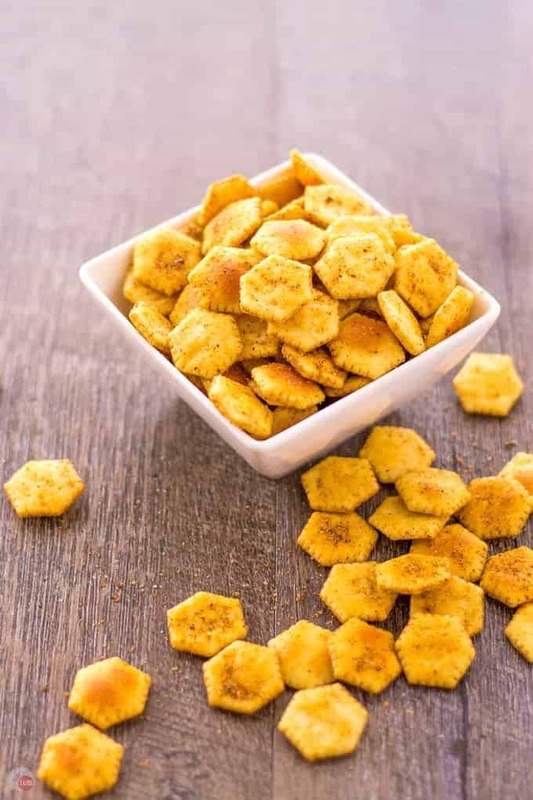 Perfect for snacking all by themselves or on a cheeseboard for some spice, Jerk Spiced Oyster crackers are the perfect bites. Or handful. I won’t judge. In a zip-top bag, mix your oyster crackers, oil, and Jerk seasoning. Mix the bag to make sure all the crackers are covered in the oil and seasoning mix. 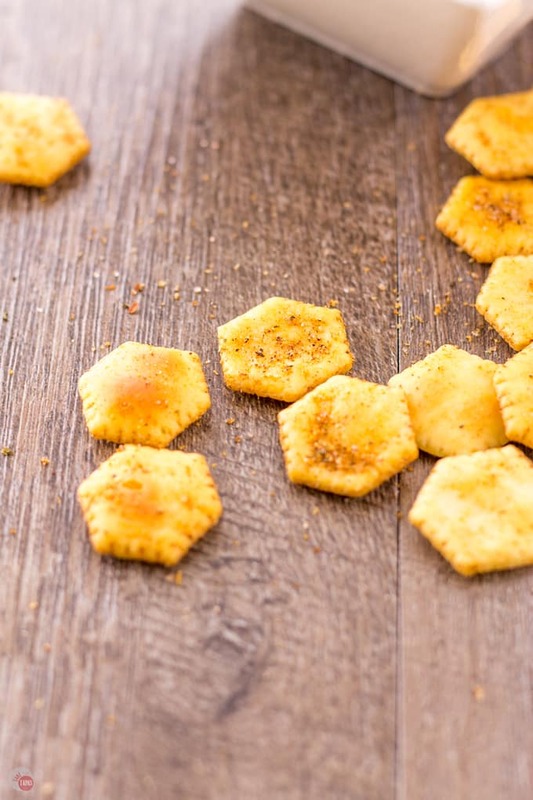 Spread oyster crackers on a baking sheet in a single layer. Bake for 8 minutes, stirring halfway through. Store in a clean (not the same) air-tight container or zip-top bag. I was inspired by this recipe from The Wicked Noodle. Awesome snack! The crowd will go wild for these during games.